Our Panax ginseng is like no other ginseng product on the market because we grow and process it like nobody else does. When you choose Bing Han, you know you are accessing optimal health and nutrition benefits. 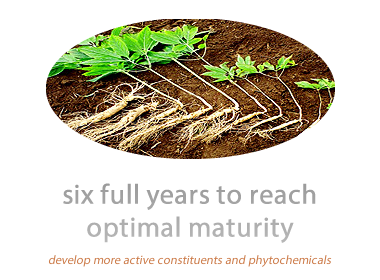 Our 6 year­ old, certified organic, low­ temperature processed Panax ginseng products are created for people who are passionately committed to their health and wellness. These people inspire us to do what we do. High in the Chang Bai Mountain, in the virgin soils of a UNESCO ­protected preserve in Shanghai, our Panax ginseng grows for six long years. In this rare microclimate, our ginseng receives the exact right blend of moisture, soil nutrients, and growing conditions. Every two years, the ginseng plants are rotated to a different plot of land in order to maximize their nutrient density. 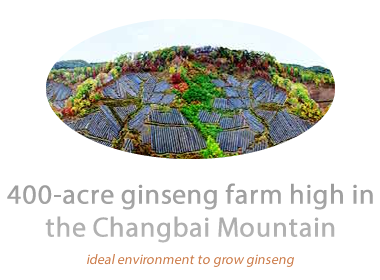 Our ginseng is grown organically and sustainably. We fertilize our soil with pine trees and allow it to lay fallow for 10 to 15 years before replanting it. We use the whole root including the “head”, “skin”, and “beard”, because each of these parts contains active components with health benefits. We process our ginseng in our own GMP and ISO certified plans in Taiwan, using a low ­temperature drying method that preserves the maximum number of active natural components. 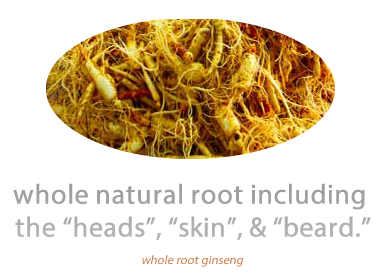 We grind our ginseng into a fine powder that the body can easily utilize.